A simple guide for beginners about how to make iPhone wireframes. 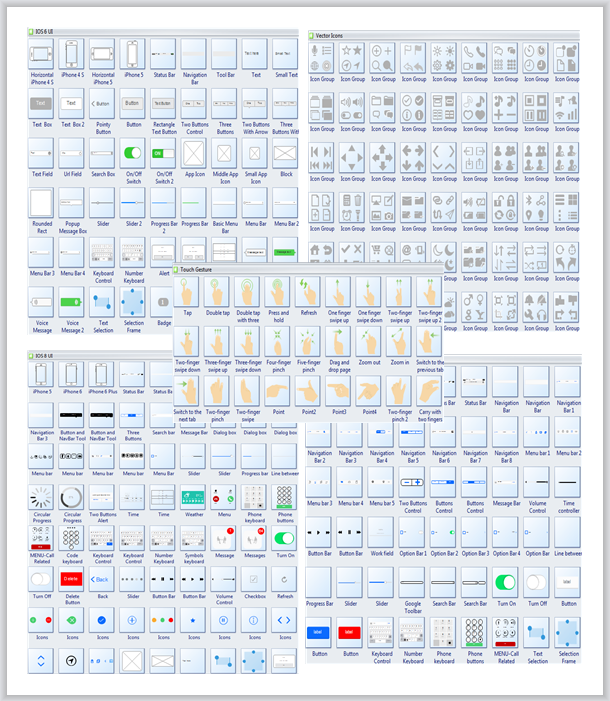 Provide a large collection of vector widgets to for iPhone application wireframing. Wireframing is a crucial step for iPhone application designs, especially for more complicated projects. It allows application developers to brainstorm functionality and communicate ideas with other team members or clients more effectively. An iPhone wireframe is a visual guide for the framework of your application design, thus the clearer, the better. Edraw offers over 500 pre-drawn iPhone widgets with high accuracy for IOS 6, IOS 7 and IOS 8 systems, available to design applications for iPhone 4s, iPhone 5, iPhone 5s, iPhone 6 and iPhone 6 plus. You can get customizable iPhone icons for text field, menu bar, on/off switch, voice message check box, slider, search box, text selection, dialogue box, weather, keyboard, time, and much more. Edraw can be used as an effective tool for iPhone UI wireframing. Start the software, and from the Available Templates, choose Wireframe. Double click iPhone UI to start a new drawing page. From the widget library, drag and drop an iPhone frame. There are iPhone 4s, iPhone 5, iPhone 5s, iPhone 6 and iPhone 6 plus you can choose. Drag proper widgets and place in the iPhone frame. You can continue to design your wireframe by adjusting icon position, changing size, refilling colors and adding texts. When it's done, right click on your mouse and choose "fit to drawing". This command can make the page size perfect fit your drawing. 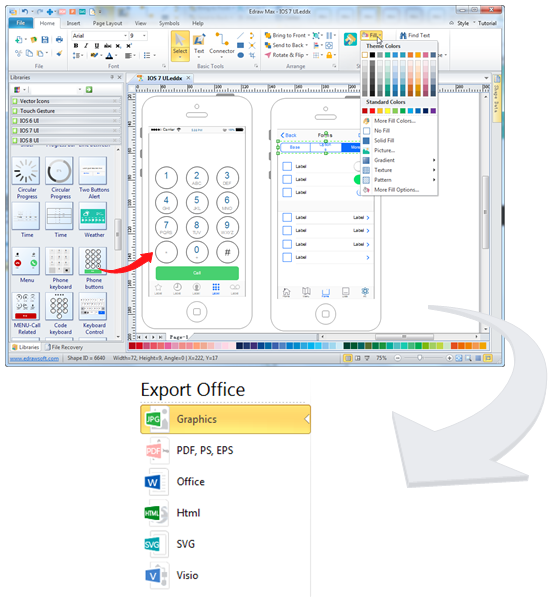 After that go to File, and click Export & Send to transform your file to other formats. To have a more complete and detailed guide, please click how to create an iPhone UI wireframe. 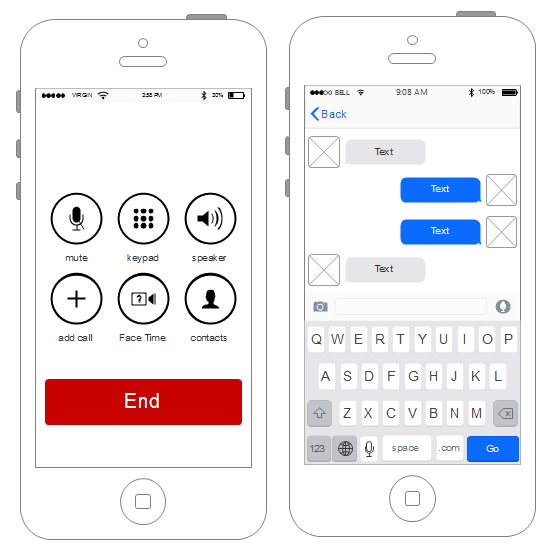 Below are examples of iPhone UI wireframe designed by Edraw. More and more users benefit from Edraw iPhone UI designer, and you will too.